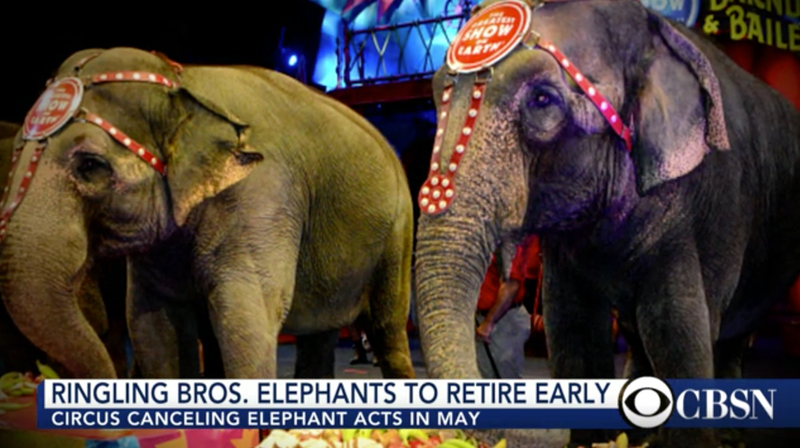 (Associated Press) ST. PETERSBURG, Fla. – The Ringling Bros. and Barnum & Bailey Circus is ending its elephant acts a year and a half early, and will retire all of its touring elephants in May. The circus’s parent company, Feld Entertainment, told The Associated Press exclusively that all of the iconic elephants will be permanently retired to the company’s 200-acre Center for Elephant Conservation in central Florida. There are 11 elephants on tour with the circus. “They’ll be joining the rest of the herd,” said Alana Feld, Ringling’s executive vice president and show producer, who is also part of the family that owns Feld Entertainment. Feld owns the largest herd of Asian elephants in North America. In addition to those still touring, there are 29 elephants on the property now, and two additional animals are on breeding loans to zoos, Feld said. It costs about $65,000 yearly to care for each elephant, she said, and the company had to build new structures to house the retiring elephants at the center, located between Orlando and Tampa. Last year, Feld Entertainment announced that the elephants would be phased out and eventually retired by 2018. Once the company began planning, it realized it could retire the elephants a lot sooner, Feld said. Elephant acts have been showcased by Ringling for more than a century and have often been featured on its posters. 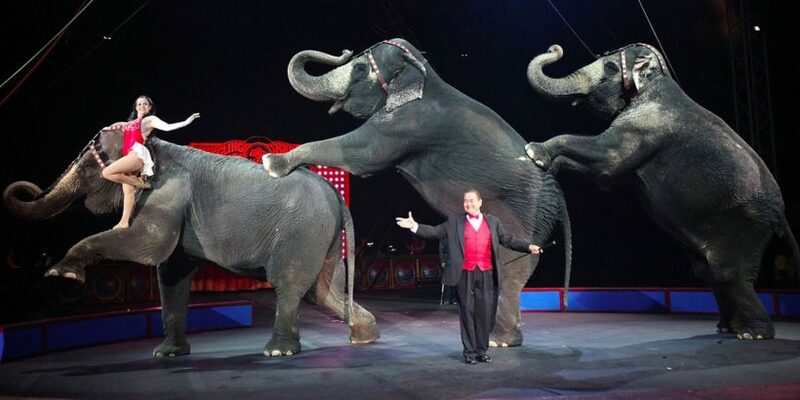 But because so many cities and counties have passed “anti-circus” and “anti-elephant” ordinances, it became difficult to organize tours of three traveling circuses to 115 cities each year, Feld Entertainment CEO Kenneth Feld said last year. Fighting legislation in each jurisdiction is expensive, he said. Los Angeles and Oakland prohibited the use of bull-hooks by elephant trainers and handlers last April. The city of Asheville, North Carolina, also nixed wild or exotic animals from performing in the municipally owned, 7,600-seat U.S. Cellular Center. Ringling’s new show will begin in July without the giant pachyderms. “We’re looking at a lot of new ways of doing things,” Feld said. She said the retired elephants at Ringling’s Center for Elephant Conservation will also be part of cancer research. ….. Animal rights activists have long alleged that circuses have mistreated elephants. 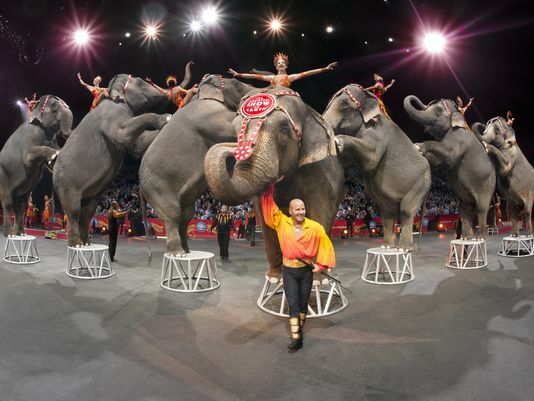 In 2014, Feld Entertainment won $25.2 million in settlements from a number of animal-rights groups, including the Humane Society of the United States, ending a 14-year legal battle over allegations that Ringling circus employees mistreated elephants. Elephants have been a symbol of the Ringling circus for decades. P.T. Barnum brought an Asian elephant named Jumbo to America in 1882. 2. 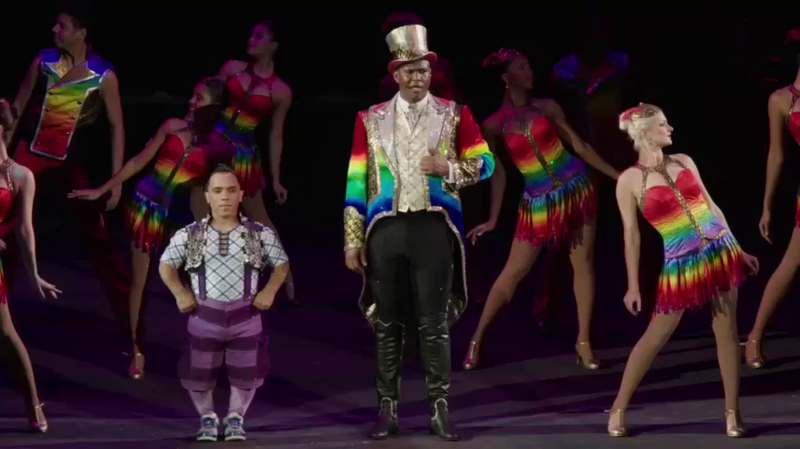 For how long has Ringling Bros. featured elephant acts in its circus? 3. Why is the Ringling Bros. and Barnum & Bailey Circus ending its elephant acts? Be specific. 4. Why will act(s) will the Circus feature in place of the elephant act? 5. Why did Ringling’s Feld Entertainment win over $25 million in lawsuit settlements from a number of animal-rights groups in 2014? 6. Animal rights group PETA wants the use of any animal in any act to be banned. What do you think: is PETA being unreasonable, or do trainers and performers working with animals abuse the animals they work with (is this their usual way of treating animals)? Explain your answer. 7. For this article, the Associated Press reporter did not interview any circus trainers or performers on how they view the end of elephant acts. Do you think it is important to the story to hear their view? Explain your answer.